Hogyan alakul majd Harry szerelmi románca? Kulasszatitkok a történetből és a forgatásról, trailerrel. He was once told by his Potions master Horace Slughorn that there is no spell that can create actual love. But Harry Potter doesn't need to turn to magic to have his heart stolen as he falls in love for the first time with the girl of his dreams. And while it might not be his first kiss with Ginny Weasley, this time it's love as the two finally realise their true feelings for each other. Harry, played by Daniel Radcliffe, 21, and Ginny, played by Bonnie Wright, 19, first shared a kiss in the last year's Harry Potter and the Half-Blood Prince, the sixth installment which was released last year. Ginny, who is the younger sister of Harry's best friend Ron, fancied Harry when she first clapped eyes on him in the first ever installment The Philosopher's Stone but he was oblivious to her. But in the Order of the Phoenix, he starts to notice her and now those feelings have become love. And as fans of the books will know, the couple eventually get married and have three children - two sons named James and Albus and a daughter called Lily. The scene showing their true-love kiss is one of many stills released ahead of the November release of the seventh and final film in the Harry Potter series, The Deathly Hallows. Split into two parts, the first is released this November and the second will hit cinemas next year. The first part of the final two films begins as Harry (Daniel Radcliffe), Hermione and Ron Weasley (Rupert Grint) set out on a perilous mission to track down and destroy the secret to Voldemort’s immortality. Without the guidance of their professors or the protection of Professor Dumbledore, the three friends must now rely on one another more than ever - as dark forces threaten to tear them apart. New shots released from the film confirm reports that the movie is likely to be the darkest Harry Potter film yet. 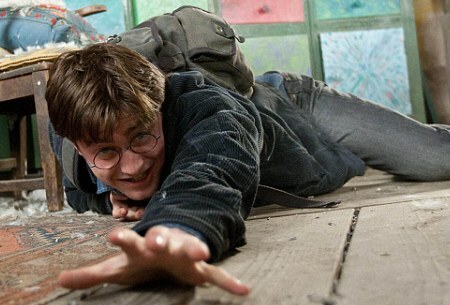 While Hermione is seen looking shocked while holding up her hands which are covered in blood, Harry is pictured looking tense as he reaches for an unknown object while laying apparently injured on the floor. Speaking about how difficult it was to shoot two Harry Potter films back to back, Radcliffe told fans at the BFI Movie-Con III in London recently: "It was hard. Before, the producers and directors were very good at taking all the pressure on their shoulders, but this time going into it we were slightly more nervous than we were before, because we didn’t want to screw it up as it's the last one. It was a long shoot, near enough 18 months, but a film set is the best place in the world as far as I’m concerned. The first part is a very weird road movie kind of thing. The first part is slower paced, but only compared to the second part. There’s more of an exploration of the relationships between the characters, that’s tested for the first times. And you’re not in Hogwarts, which gives it a very different feel from the other movies. This is the first time I’m genuinely excited to see the film. Because it was filmed over such a long period, I’ve genuinely forgotten what we shot early on." Radcliffe's co-star Watson said before shooting the final scenes that she was certain she would find it difficult to film the exit scene, adding: "It's been half of our lives. It's made us, it's formed us. It's such a big part of my life so it will be really sad." 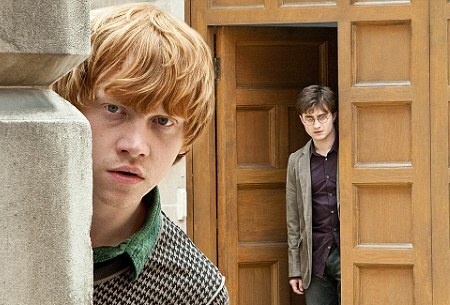 Harry Potter And The Deathly Hallows sees director David Yates back at the helm. He was also behind Harry Potter And The Order Of The Phoenix and Harry Potter And The Half-Blood Prince. The second Deathly Hallows film will see Harry, Hermione and Ron aged, using the same ageing technology employed by experts on The Curious Case Of Benjamin Button. Speaking about how she would find it to see herself as a 40-year-old, Watson laughed: "I can't wait to see that!"